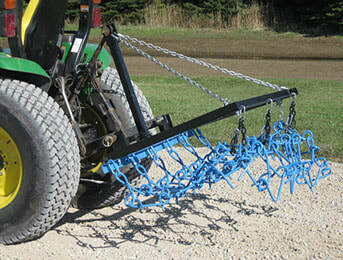 ​The main advantages of the Chain Harrow include, the framework, because of the angle of all parts, allows it to do much of the work (not just the teeth) and also tends to separate all joints, increasing wear ability. This design also allows the tail section to stay down and not roll forward. This is a great pasture harrow, the draw bar is made from strong round structural tubing, and manufacturers also put a lot of thought into the hitch. The hitch is made with chain, rather than rods and eyes. Because our hitch has more flexing points it will last much longer. 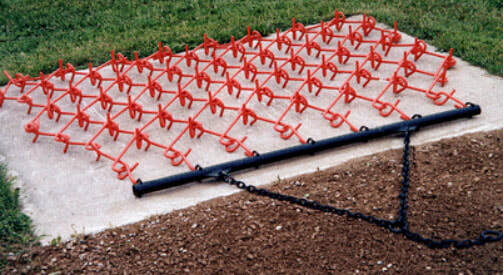 The chain hitch is also easier to handle and store. The May-Bridge Harrow Caddy is a unique, new patented concept. The many harrow carriers that have been on the market for a long time, require a frame work over the harrow attached by many drop chains. They lift from the back and on some models raise as high as 12ft. 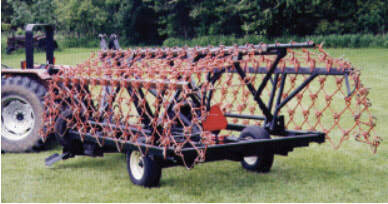 The "May-Bridge" Caddy has no framework over the harrow at all and has no drop chains. It lifts from the front and raises to a height of only approximately 5 1/2 ft. You can even use the caddy to turn the Harrow over right in the field. The Caddy is designed to facilitate shipping in only 2 compact packages. It also incorporates a universal design so that the difference sizes may be made up at the dealership, reducing inventory costs.